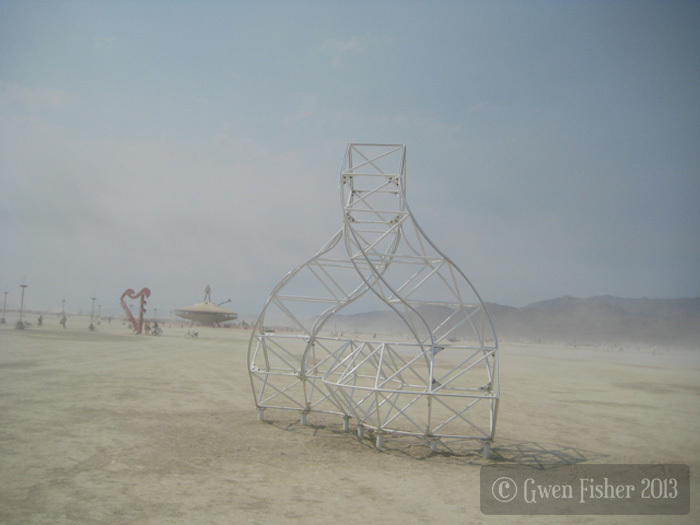 For the last few years, I have been attending a festival in the middle of the Nevada desert called the Burning Man Art Festival, where tens of thousands of artists and revelers join together each summer to celebrate art while camping in some of the harshest conditions in the US. One of the peculiar features of Burning Man is that groups of people band together into "theme camps" which offer free gifts in the form of art, music, food, drinks, experiences, and other life pleasures and fancies to almost anybody who stops by. Many of the gifts come with the touch of a prankster, designed to shock and amuse. Last year, we created the idea of Math Anxiety Camp, where we would give people math problems in an attempt to provoke math anxiety. 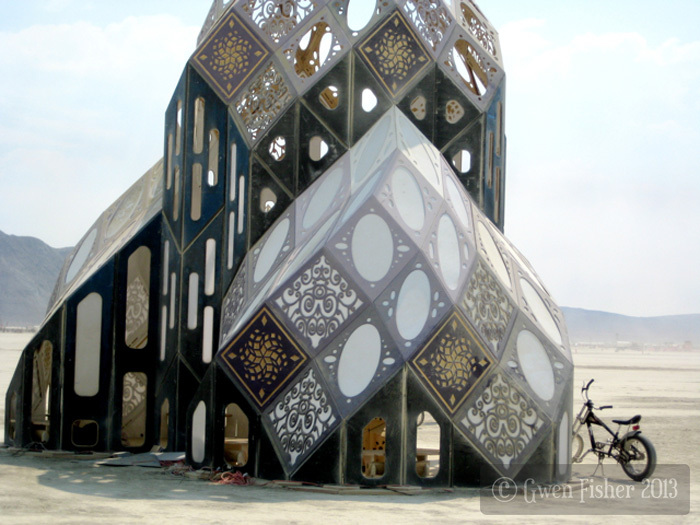 Burning Man has a culture of gift giving, and we joked, "Math anxiety: It's our gift." Great art provokes emotions. This is a reason why music is so popular and powerful. Music provokes intense emotions in listeners. Have you ever cried to a love song? I have. Now, I have never seen a piece of artwork that was designed specifically to provoke math anxiety. 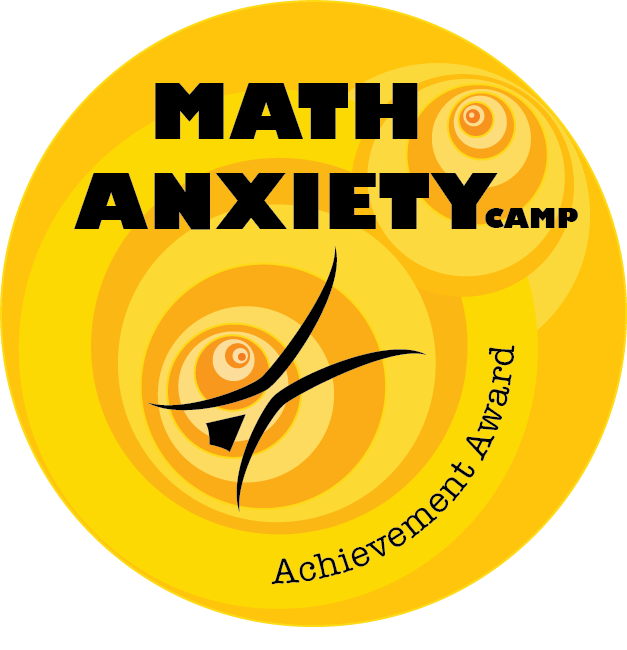 So I created Math Anxiety Camp with the help of my camp mates. 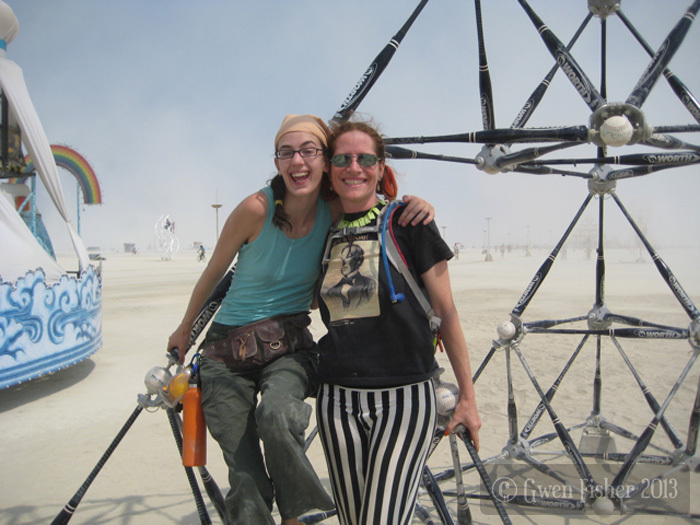 For Burning Man 2013, we wrote a short book of 38 math problems, and I designed a sticker so we could hand out awards to those who achieved math anxiety. 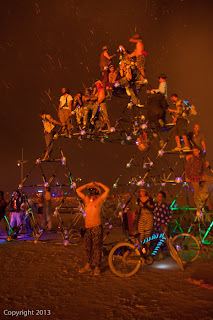 My campmates and I drilled unsuspecting Burning Man attendees (i.e., burners) with our math problems in the hopes of provoking the emotion of math anxiety for the sake of art. We did all of the things you're not supposed to do as a good math teacher, like telling our examinees, "You should already know this," "You should have learned this last year," and "Work faster! Faster, faster, FASTER!" When participants got wrong answers, we made loud buzzer noises. The purpose was not to focus on the math, but to focus on experiencing and emphasizing the emotion of math anxiety. Vi Hart and I wrote the book of the math problems together with several features in mind. All of our math problems were designed to be actual math problems that have at least one right answer (some have more). Topics included arithmetic, combinatorics, geometry, calculus, and logic. Problems ranged in difficulty from trivially easy (e.g., "Name a number that is 3.") to tricky (e.g., "Name a triangle with two right angles.") but all were chosen to be simple enough that most of our subjects would at least understand the question, even if they couldn't solve the problem. Some problems were designed to be funny. We included several classic, well studied math problems that are known to confuse people. Most of the problems have multiple choice answers, and the distracters (incorrect wrong answers) were designed to be funny or deliberately confusing or deceiving. We included lots of "All of the above" and "None of the above" options because of their cringe value. We added scenarios relevant to the art festival, and where the characters were in mortal danger. 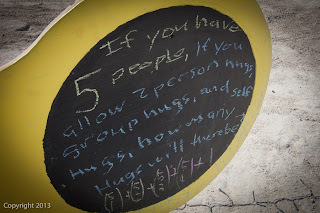 My campmates eagerly distributed math problems, books, and awards throughout the festival. I was pleasantly surprised at how many people engaged in the project. We handed out nearly 500 achievement award stickers and almost 20 math books to specific people who wanted to own a copy. I listened to and heard about several people who read the entire book, thoroughly musing over each the 38 problems. Some were math teachers, married to math teachers, physicists, geologists, engineers, and others who just enjoy the satisfaction of solving a good math problem. Here is a PDF copy of the 2013 Math Anxiety Math Book if you'd like to take a look. This version is edited to make it more suitable for a general audience. Ethan Port brought a whole suitcase of math books, and Paul McGlaughlin painted us a sign for the front of our camp so that passers by would know we were there and what we had to offer. 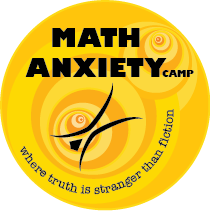 As one young man biked past, we overheard, "Math Anxiety Camp! That's TERRIFYING!" So of course, we invited him in to share our problems and win an achievement award. When people asked us about our sign, they often confused us with "Math Camp at BRC", a different theme camp that touts themselves as "a safe place for mathematics." We were the opposite: an unsafe place for mathematics. We were there to give problems, not solve them. "Our problems are your problems," and, "We have so many problems, we'll give you some!" I saw people tense up instantly when they heard these statements. Although we gave them lots of problems to solve, and many people successfully solved them, my favorite part always was watching their anxiety transition into laughter when they were presented with anxiety achievement awards. Paul painted half of the sign with chalkboard paint so we could write a new problem each day. We left chalk by the board, and many of the problems were solved by the next morning. 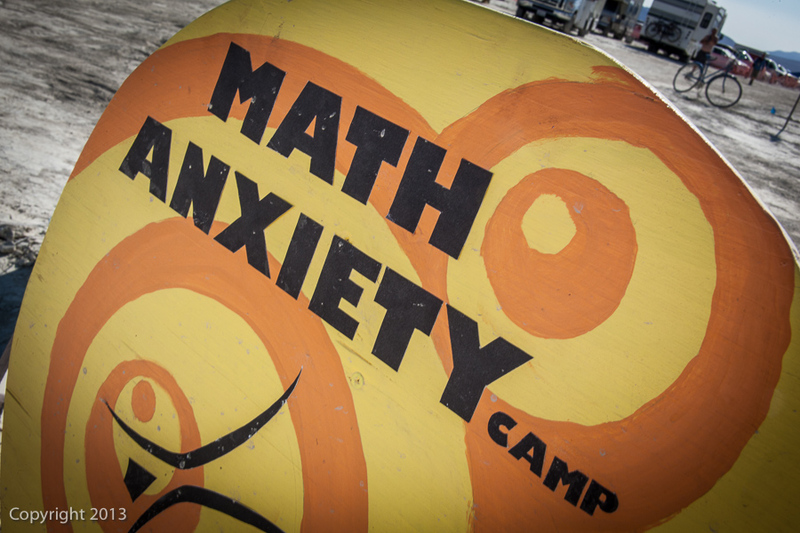 In addition to working independently, Math Anxiety Camp also joined forces with Camp UFOm and the Civil Defense Camp. UFOm provided an "interblastive foam experience" where participants performed foam art. 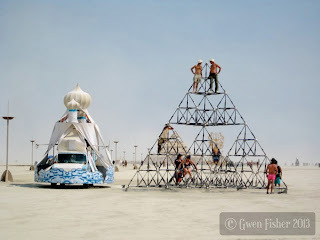 UFOm was so popular, that the Civil Defense crew was enlisted to conduct drills on the revelers in an attempt to slow down the line of entry into UFOm and deter all but the most dedicated from entering. Burners were subjected to drills including physical exams such as a rope course, running laps, push-ups, jumping jacks, rolling in the dust, and games of duck-duck-goose. There were also oral exams on outdated American civil defense literature from the 1940s, and people were drilled with math problems from the Math Anxiety Camp Math Book. 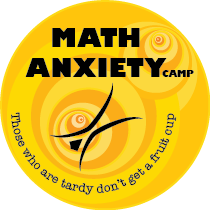 A little background on the Math Anxiety Camp project: I am a former teacher of mathematics, and the idea of provoking math anxiety on purpose is simply ridiculous to me. I spent many years of my life trying just about anything to minimize, or at least reduce math anxiety in my students because students who are too anxious don't perform well in school. Math anxiety makes people hate math and avoid it. Wanting people to love math and engage, I read many papers on math anxiety, attended lectures on the subject, wrote worksheets and led discussions in my classrooms that were designed to reduce my students' anxiety. It seemed to be an ever-present problem in my classrooms of college students, many of whom had learned to fear math from a very young age, typically spawned from negative interaction with their teachers and parents. I was often surprised at how quickly some of my students were to state their disdain for mathematics publicly, even though they were studying for professions that would require them to do mathematics regularly, like engineering or teaching children. My experiences as a math teacher showed me just how common math anxiety really is and how intensely some people suffer from it. Some people will go to great lengths to avoid math at all costs just to avoid the anxiety that goes with it, and this makes me sad. But outside of the context of teaching, it seems that math anxiety is an emotion that is rarely discussed in depth, especially in the art world. Creating math anxiety in a novel context devoid of high-stakes consequences seemed like a good way, a safe way for people to confront their negative emotions about math. Math has been a theme for me and my camp mates already at Burning Man. This year, Math Anxiety Camp was also an art support theme camp, building Bat Country, a Sierpinski tetrahedron jungle gym. 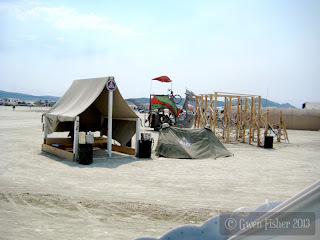 Here you can see Bat Country this year on the night of the Man burn. 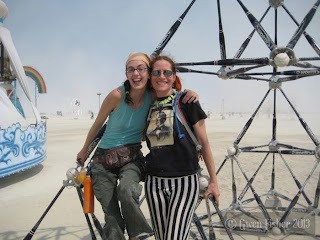 Here is Bat Country with the Rainbow Bridge art car. 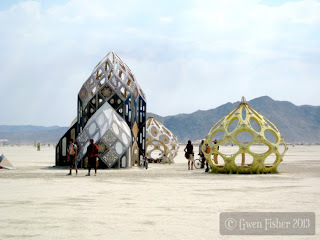 The mathematics behind these "pavilions" is polar rhombizonahedra, one of my all time favorite mathematical structures. 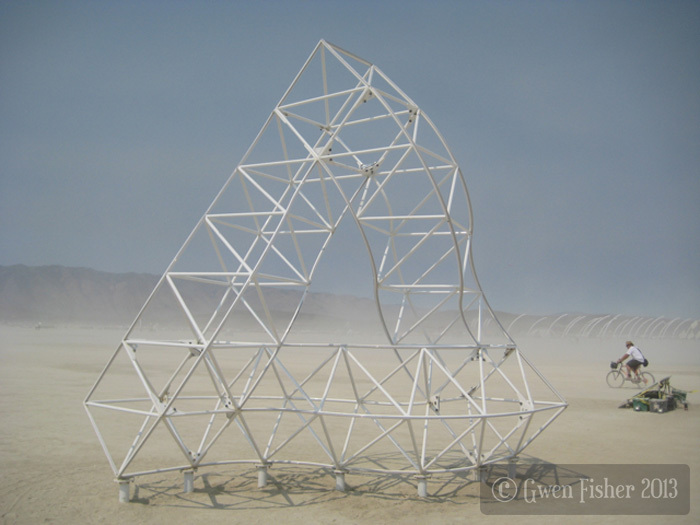 I've been watching this series of inhabitable structures evolve, changing from year to year, but still maintaining its same aesthetic and mathematical essense. This portion below was the new addition to the set for 2013. The panels have a lot more details than most of the older forms made in earlier years. Beautiful. My favorite new piece of mathematical art this year is the honorarium art project, The Penrose Triangle by Blake Courter and Blake Courtney. This triangle looks very different from different perspectives. Unfortunately, I missed a shot of the triangle in perfect perspective where all of the lines look straight, but this one is pretty close. Fortunately, I climbed up to the top of this triangle and successfully climbed back down without killing myself. 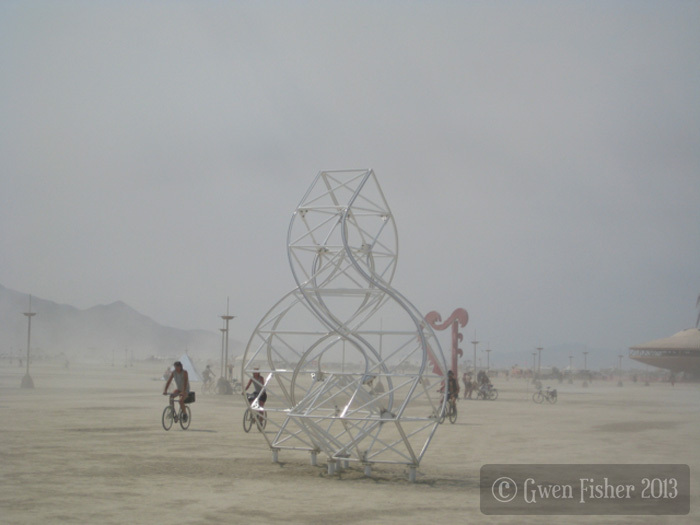 Burning Man always has a plethora of climbable objects, and I love to watch the acrobats and other "monkeys" climb and hang off these piece. 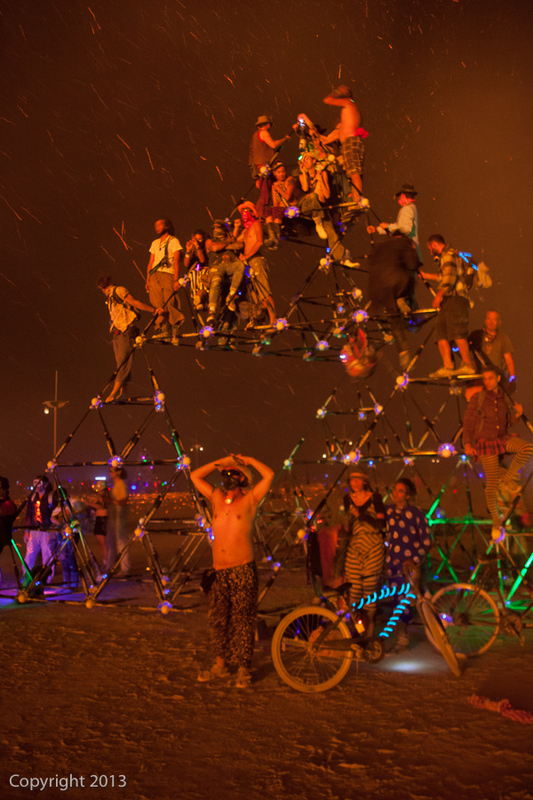 However, I rarely climb anything at Burning Man, which is a little ironic since I brought my own jungle gym (see Bat Country above). Although I don't generally suffer from math anxiety, I do suffer from a fear of heights (or high anxiety), but I don't really want to talk about that emotion. Pavel Curtis sent me this link. Thanks for the kind words, Gwen! It was great to meet you at the burn. BTW, the Penrose Triangle blog is at penrosetriangle.com. I laughed a lot doing (or trying to do) your math test. Funny!! !